Marketers are in an arms race against the “finite attention spans” of consumers and must put value over volume if they want to avoid diminishing digital marketing returns, Marketo’s chief executive claims. Speaking on day one of Marketo Marketing Nation Summit, recently installed CEO, Steve Lucas, set out his vision around the new fundamentals marketers need to embrace in the engagement economy, and the expanding role the vendor hopes to play in supporting modern efforts to build brand, drive revenue and improve impact. According to Lucas, the marketing industry’s great challenge is to leverage technology without allowing it to “reduce us and the people we work with or buyer we care about to numbers”. “Up until now, technology advancement has inspired people and brought us closer together,” Lucas told attendees. “Yet now we’ve reached a point in time where people fear tomorrow’s technology will lead to the opposite – a retrenchment into silos, and potentially the loss of the personal connections we value most. Lucas cited three key trends challenging the fundamentals of marketing. The first is the law of supply and demand and in particular, getting the attention of consumers. “The reality is our attention spans may be shrinking, perhaps intentionally, and we need to focus more because we have so many things coming at us,” he said. “Part of it is simply how voluminous and loud our conversations have gotten: If everyone is shouting in this room, no one voice sticks out. Buyers also have greater access to information about brands, meaning they’re more sophisticated and empowered, Lucas continued. The third reason is the rise of social media, which Lucas described as “gritty, raw and authentic”. While digital marketing has been incredibly effective to date, marketers are now facing a law of diminishing returns, Lucas said. “Our engagements over time need to be more scarce and frankly, more valuable,” he said. “Volume unchecked can damage our brands. Lucas said today’s consumers want to forge real connections with brands that get them personally, and share their values. “We’re no longer able to prescribe the terms of the relationship with our buyers,” he said. “In a world where marketer works for buyer, we’re stewards of their journey and our role is to curate the best experience for them. Lucas said engagement requires carefully curating a personalised and meaningful experience in whatever medium and time buyers wish to engage in – something that’s not yet happening, he said. “Engagement is about value and values. Customers care about the products they’re buying and who they’re buying from,” he said. The second key is to learn. To do this, Lucas recommended “embracing the data science within us”, and turning everything listened to into insight. He added brand advocates are 1000 times more valuable than an impression or even a prospect. “Do you know how many brand advocates your company has? If not, now is the time to learn,” he said. Marketo’s group VP product management and UX, Cheryl Chavez, followed up Lucas’ high-level advice with a peek into Marketo’s 2017 product roadmap that it hopes will back up its engagement economy ambitions. The new offerings come off the back of Marketo’s new big data architecture, which launched under the ‘Project Orion’ replatforming work undertaken last year that is now being rolled out across the customer base. The new architecture allows the platform to ingest trillions of activities to listen at scale and also provides the foundation for core automation, analytics and adaptive engines, Chavez said. A key investment this year is around campaign throughput, aimed at helping users execute more quickly on all data sources coming into their systems, including from Internet of Things connected devices. The vendor is also setting a new vision for analytics, Chavez said, to better empower the entire marketing organisation through data. The first way Marketo plans to do this is by unifying all data analytics into a single place for marketers within the product. This will include delivering role-based dashboards, as well as visualisations that bring data together to create guided journeys. The first cab off the rank was Email Insights, which was announced in 2016, and several more are on their way this year, Chavez said. One is CMO Insights, which is designed as a single place to see everything about the business and helping them chart a course for growth. Insights include current quarter goals by pipeline, revenue, and a snapshot of strategic initiatives. A marketing performance insights dashboard will also be rolled out to help identify programs or channels that are underperforming, while Web Insights will serve as a summary dashboards surfacing traffic coming from top referrers, including social platforms, Chavez said. It wouldn’t be a technology conference without a reference to artificial intelligence (AI), and Marketo is another martech vendor investing in building AI capability to fuel what it calls its ‘Adaptive Engagement’ platform. This will be available when building engagement programs, Chavez said. “With the flip of a switch I can decide if I want to make the content, channel and the cadence adaptive, then the adaptive enginewill select the best content to send at the right cadence and to the channel best to reach the audience,” she explained. 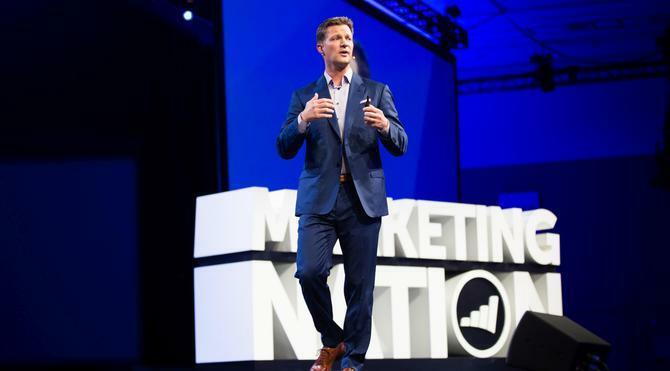 In addition, advancements around Marketo’s account-based marketing (ABM) product are on the way, including new features for marketing and sales alignment, data accuracy, custom fields, an account hierarchy that mirrors the CRM, and an Account Insights dashboard for sales. All products are due for release later this year.